It makes sense to offer subscription options for products that either constantly run out (pet food, water, toiletries, etc.) or every so often come in new editions (magazines, subscription boxes, collectibles, etc.). For one, it saves customers the inconvenience of going through the buying process again and again and, most importantly, it saves them from switching to a different store in between purchases. Within Magento Subscriptions & Recurring Payments extension we have assembled all of the tools you’ll need to implement subscription options at your store. You are given full control over defining the period of subscription, the size of payment, and the way new functions interact with native Magento functionality. The product or service may be set to be delivered however often for however long, or even indefinitely*, until the customer cancels the subscription himself. Flexible starting day allows to begin Magento recurring payments either at the moment of purchase, particular day of the month, or the date specified by the customer. Specify the duration and cost of the trial period - lure the customers in with discounted prices or even by allowing free trial. Set up a starting fee - a one time payment representing the cost of signing up for the subscription service. Iteration fee is charged to the customer every time the product or service is delivered. No need to go through a complicated payment set up - the Subscriptions & Recurring Payments extension supports external payment gateways, namely PayPal, Authorize.Net, and eWay. Each subscription is logged within the extension creating a list in backend, allowing you to sort and manage subscriptions however you see fit. On the customer’s side subscriptions may be viewed from within the customer area. Each subscription block may be given a custom name and assigned a priority value defining its order of appearance within the frontend page. Customers may be moved to a different customer group upon signing up for a particular subscription. This Magento subscription extension allows recurring billings for simple, downloadable, configurable, or virtual product types. ** Support of specific payment methods depends on the country. We've been using SARP for half a year already and find it pretty functional and well-designed. The module is very stable which is definitely a big advantage for our business. There is just one thing missing that we had to customize ourselves. We needed to allow our customers to add multiple items to their carts. Other than that, the extension suits our demands very well and we highly recommend it. I just installed it and I admit that this extension is really of first quality. Will just depend on the tech support for features such as "composite products" and additional payment method. We have been using this tool for a month already…and what can I say! It simply does it job and makes my life easier. We have encountered a small conflict with another module on our site, but aW support was really helpful and we resolved the issue in record time. Great job, guys! We recently upgraded from SARPv1 to SARPv2 to ensure PCI compliance. To our utter disbelief Aheadworks have removed support for discounts at checkout!! We were completely stunned because there was no mention that this existing functionality, which supports a main feature of Magento, had been removed. Now we can no longer run promotional campaigns with discount vouchers. This was supposed to be an upgrade but feels like a downgrade. There was no reasonable explanation why this happened. The module doesn't offer multiple payment methods per product so the user can only fund their subscription with either PayPal or eWay. On v1 we used PayPal as the payment processor but the user could pay by card. Our web developers were told that using PayPal would still allow users to pay by card. Actually this was incorrect. It allows the buyer to setup a PayPal account which they can fund with a card. This was pretty disingenuous advice. As a B2B merchant offering PayPal as a sole payment method looks poor. So we tried to change to eWay to allow card payments only to find that the payment took place on page, not off page, which meant it would fail PCI compliance. Upgrading to v2 has been a massive backwards step and has left us looking for a new module. Very poor practice removing existing functionality without highlighting the fact and leaving the user in the lurch. We bought the extension for a magento site and had an issue installing. Submitted the ticket and had a very quick response in having the extension up and running. Very satisfied with the tech support, thank you Ekaterina! I ran into trouble with the extension early on. I couldn't even get it to install properly. Scripts were failing and database tables were not be created that the extension needs for it to work. But, I contacted support and they got it solved right away. Other than those issues, it seems to be doing the job just fine and the support team was very helpful. A solid and reliable extension that does its job. We're offering regular billing/ delivery, and this ext is packed with the exact features we were after. I have had an enormous amount of problems with this extension that has impaired my business on a daily basis. This is only a small synopsis of the problems I've experienced - all with no apparent fix. If i could give -0 stars this is what I would rate this. Beware!!! 1. When subscribers update their accounts the system does not recognize the new address or credit card information. So, products are shipped to the wrong address or the credit card is repeatedly declined. 2. Subscribers have to cancel their subscription, thencreate a new subscription if they have to update information. If they've missed several months. The system will charge them for the months that lapsed since their account was canceled. I have had some customers charged 10 times for one subscription. 3. Cannot migrate subscribers from the old version to the new version. 4. Everyday I have an issue with my subscribers' accounts due to using this extension. I'm losing subscribers because of this extension. I highly do not recommend this product. I have seen other subscription extensions, but this one comes with many features I was looking for. Only one subscription item allowed in cart at a time. Subscriptions can only be applied to simple products, not bundles. These limitations may not seem essential before you install the module, but once everything is in place these omissions will become a major setback if you intend to treat the subscription products like conventional Magento products. Just what we were looking for, allows us to have customers pay for a subscription. Does everything that it says it does. Would recommend. This module has been working as the basis of our store for almost one month already. Subscriptions are offered to all our products. We run 2.0 version and I want to express gratitude for this incredible plugin and thank the staff and developers for the amazing work they have done. This extension reduced my workload by 50% and keeps all the subscriptions in order! I can at last sleep at night without fear of sudden crash of customers subscriptions. This module is extremely reliable. We have a bookshop. We chanced upon this extension and decided to offer subscriptions to our customers. And it works perfectly. Now we don't need to send any notifications about new books from a collection, we just sell the entire collection as a subscription. We had an issue with our payment gateway, but the support team resolved it in two days. Thank you. The module and support are Great! Best subscription and recurring payments module for magento with many customizable options to meet all merchant needs. Installation was easy and straightforward. Integration with custom themes requires some development knowledge, more documentation would be helpful. Additional payment method/gateway options in the future would enable more sales. The module works perfectly. It did exactly what I needed it to do. It was easy to install and setting up recurring products was a breeze. Works well with Authorize payment gateway that is included with Magento. We're are an online music education company with high def downloadable video lessons, featuring real songs and many of the artists themselves. We're using this extension to convert our business from a single or bundled purchase model, into a monthly or annual subscription membership. We tested the module using a trial offer, and hooked it up to Magento is very short order, leveraging Magento's rewards function to get the particular experience and offerings we wanted. We're very happy with this module and looking forward to it helping transform our business. We've used this product to manage 100s of monthly payments with Authorize.net for years. It's always been great. The code and database were cleanly assembled enough for us to easily adapt the extension to work with ARB. I purchased this extension for a site that had weekly recurring orders as well as normal single purchases. The extension was easy to install and setup. Our store used Paypal as the payment processor and we did have some problems getting things to work properly with Paypal. I feel the documentation for the extension needs to be updated especially as it relates to Paypal and its implementation but over all the documentation on how the extension works is GREAT. I would recommend this to other but if you are using Paypal be prepared for some struggles up front but after no problems. The service works ok, but its uneditable which is a bit annoying. Before moving to Magento, our old system allowed for the customer's personal or payment details to be changed, as well as alllowing them to change the frequency. Allowing it to be placed from the cart, as another has pointed out, would also be a great feature. Hope these additions can be made as its close to being an excellent product. Hi. I just want to say - that extension saved my business. Really good job, flawless features, customer level-up is brilliant. This module completely resolved my client's issue with subscription management. The install was a little tricky, but aheadWorks tech support team was very helpful. Good module. Many of our competitors have a similar function on their sites, but they allow the customer to choose autoship on the View Cart page also. This would be a great feature to add to this module. Good modules, but I can't place orders from backend if the product is downloadable. Please fix it as soon as possible. We expected to have some complications when starting to use this (it is a model that we're not used to), but it seems that as long as it produces orders the same way as normal orders, we'll be fine. We're excited to start offering subscriptions to our customers and this platform will help us do that. This is a good module but it does not allow for orders of subscription items to be entered via the backend. Our company takes a lot of phone orders so it did not work well for us. I hope that they can find a solution to this issue in the future versions. Turn one-time purchases into subscriptions. Want to benefit from per-product subscriptions and the Braintree support? Try our brand-new Advanced Subscription Products for Magento 2! × Tempt customers into buying more as it’s easy as breathing now. 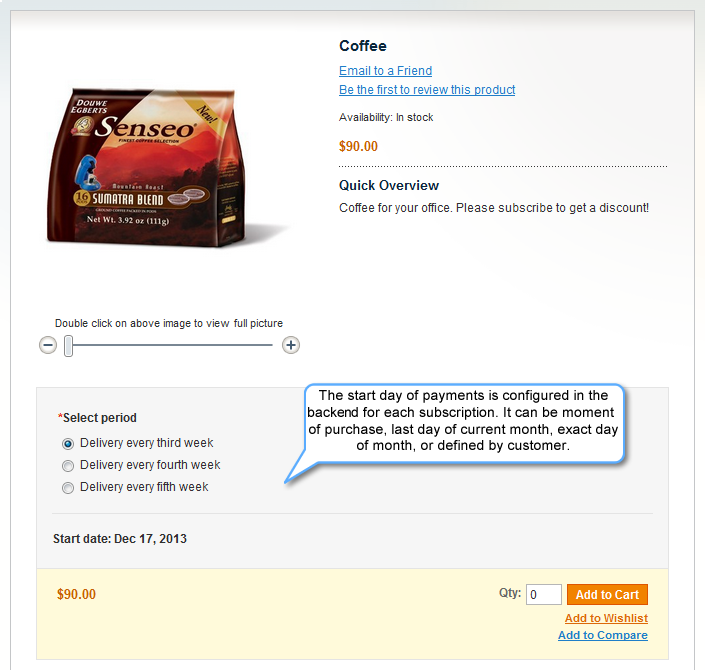 Allow subscriptions and save customer time on buying the same things every day or week. Provide a quick and safe trip to checkout with Magento 2 AJAX Cart and Magento 2 Onу Step Checkout. 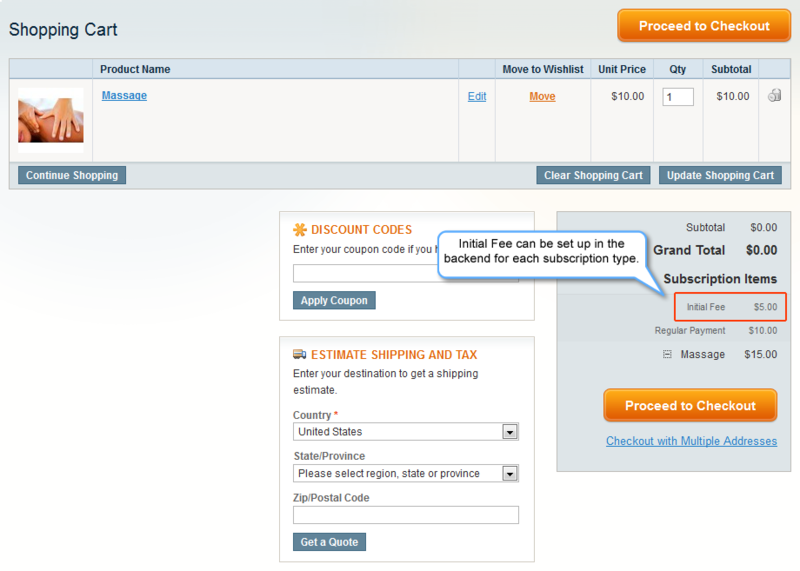 Make appealing subscription offers with the Magento Subscription & Recurring Payments extension! Create Magento subscriptions with individual supported payment gateways (one per plan), payment schedules, and pricing settings. Adjust subscription prices to each particular product. Cover a vast language segment with the multi-store and multi-currency support. Boost profits by adding flexible subscription plans to bundle, configurable, simple, downloadable, and virtual products. With our Magento subscription module, you can create plans of various durations. Plus, you can set individual regular and trial prices and initial fees per product. Our Magento membership extension ensures protected transactions. The holders of the PayPal Express, Stripe, Adyen, and Authorize.Net accounts (both guest and registered users) will fully benefit from the provided subscription functionality. The whole purchasing process is presented in the form of a step-by-step checkout. So, your shoppers can make orders by seamlessly navigating between those steps. Configure subscriptions in a few tweaks. All your subscription plans are automatically shared among all related products. With our subscription module, customers can compose own kits by purchasing several products within the same subscription plan. Increase sales by providing customers with subscription billing and subscription options for products and services. For many customers, subscriptions became a key factor determining the quality of a web store’s services. This makes sellers to consider subscriptions as the necessary functionality for their stores. Subscription & Recurring Payments for Magento is a straightforward extension that allows adding subscription options to any product in the catalog. Thanks to highly customizable subscription plans, merchants can provide customers with most suitable subscription alternatives. The functionality offered by the extension allows managing ecommerce recurring payments and creating subscriptions valuable for both merchants and customers. With our extension, customers will receive products regularly and in time. Meanwhile, merchants will get continuous and predictable revenues, guaranteed customer retention, fixed product costs without discounts and other price cuts. Subscription ecommerce models can be used successfully both in products and services, B2B and B2C areas. Subscriptions start coming to the forefront. Over the last three years, the segment has grown by 3000%, and numerous merchants, like Starbucks and Sephora, began adding subscription ‘boxes’ to their offers. 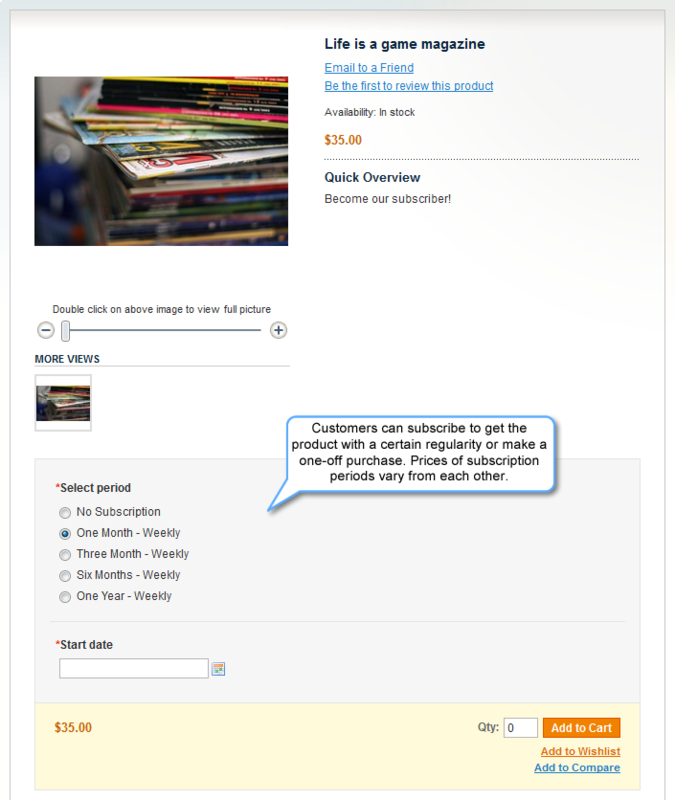 Apply an entrance fee to any subscriptions offered in your store (e.g. membership). With our extension, the entrance fee can be applied to any subscription plan. When enabled within the plan, the entrance fee can be set and managed on the product level. Complex products, such as the configurable ones, can have an individual entrance fee set for child products. Depending on the product or service offered, the entrance fee can cover the most of the product’s cost, while recurring payments will play a support role reminding store administrators and customers of the subscription prolongation. Thus, having set an entrance fee of $200 for the gym, you can charge customers $20 each month to create a membership service. Carefully thought out and calculated subscription programs with initial fees included can cover both service costs and membership expenses. Motivate new sales using trial periods with discounted prices. The customers that are not sure about the value of the provided items often need some additional incentives. This way, the discounted trial periods for those items can certainly promote new sales. The Subscription and Recurring Payments extension for Magento allows you to provide individual trial prices for each product and specify the number of trial periods for each subscription plan. 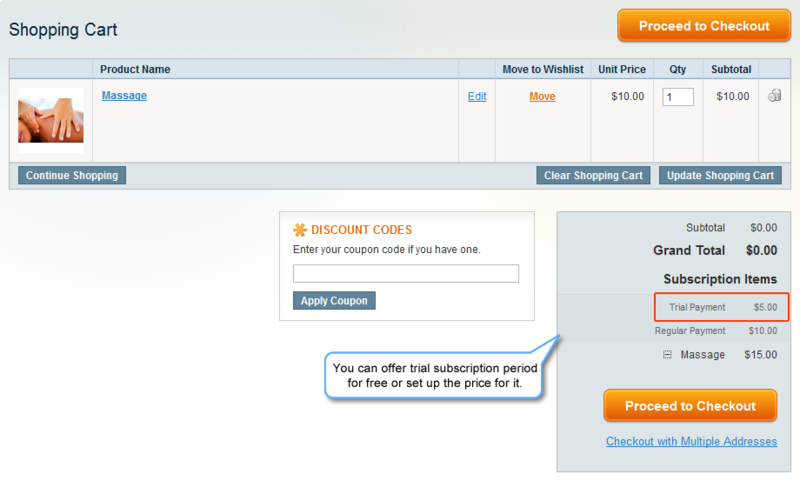 The discounts provided during trial periods are shown on cart pages and clearly visible for customers. Trial periods included in subscription plans increasу customers loyalty significantly as soon as, according to some stats, up to 75% of trial users become regular customers increasing your sales and revenues. Enlarge the average order value with the functionality allowing customers to purchase multiple products within a single subscription. 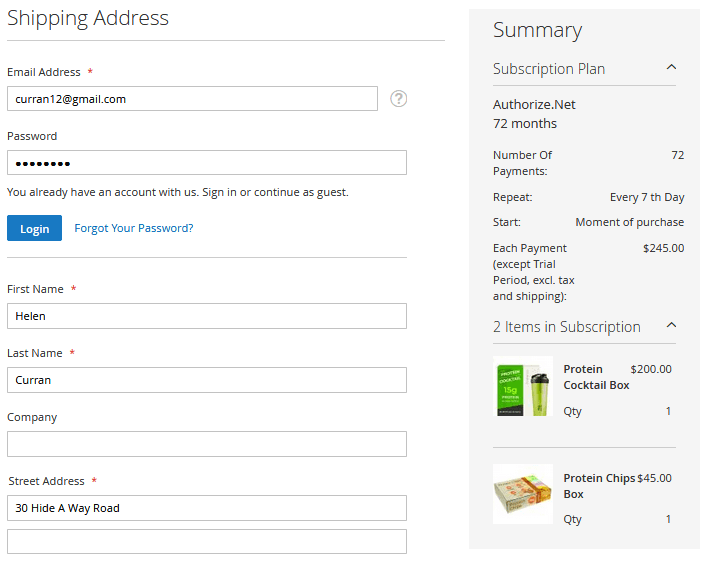 Purchasing several products each within a separate subscription is quite tiresome for customers. The Subscription and Recurring Payments extension avoids this nuisance by allowing customers to add multiple products in one subscription. Using this functionality, the customers will be able to compose their own product kits, so-called ‘boxes’. Surprisingly, the variety of popular boxes is just incredible: products for pets, snacks, cookies, beauty products, DIY activity supplies, wine, food, books, vitamins and supplements, tea and coffee sets, toys and children products, etc. With the multi-product subscription functionality, you can offer your customers a chance to create individual and tailored sets of products they need. This way, you can provide your customers with the required level of shopping convenience and increase the overall sales volume with extra products added to their subscription carts. This is extremely important, since striking 41% of retail revenues in the U.S. come from repeat purchases made by only 8% of all visitors. How does the Magento Subscription & Reccuring Payments extension beat the competition? Installed the extension on our first Magento 2 shop so we had no experience in this code at all and thus needed some support. The guys from AheadWorks did great at supporting us. We also needed a little bit of customization which they did perfectly. So in general, everything went very smooth. Extension working as expected, there were some issues I faced when I was implementing the extension but support team sorted out all issues very quickly. Extension works as expected, there was only a small issue relating the shipping on the Subscription checkout page, and the support team sorted it out very quickly for me. I would recommend this extension. I love the way the UI in your products works. It's really very intuitive. I’m not a computer geek thus some help was needed. Support team have explained everything I was confused about and were very patient. Now I can see the extension is really simple to set up and manage my subscriptions. Yes, I would recommend this module to store owners who also use repeating sales. Awesome guys, thank you very much for your help. It works! Very useful module for selling additional services. Can be easily configured and, most important, works with Adyen. The subscription extension is just what we needed and it's really a powerful tool for recurring orders. Configurations are flexible and the checkout process is simple and looks natural. I was very impressed by the quality of service they provide! Surely will get back to Aheadworks for more extensions! So, first off all i want to say this is powerfull program/extension and it really helped us! But i want to compliment your support because every time i needed help you gave me real solution, and you helped us every time!! Thanks for your support and quick and professional responses! Very good extension! Installation was easy. Ahead works support responded quickly to my questions, really friendly. Had an issue with my custom theme, though, but they fixed it same day! Can't ask for more. What I love about this extension is that it is very easy to configure and use. Great job, guys! If a customer orders a monthly subscription for a product, will future changes in the product's price be reflected in subscriptions, or are subscriptions locked at the initial price? The changes in product price will not be reflected on subscription charges: customer will pay the amounts which were set at the moment of subscription purchase. I have set up Special Price for a subscription product but it's not being applied. What can be wrong? Subscription & Recurring Payments uses its own Regular Payment Price that is not affected by native Magento Special Price and Price Rule options.